The team who built the giant Farmers Santa in 1960 would be amazed at the icon’s fluctuating fortunes. The statue enjoyed a 30 year run until the store’s Hobson Street site was sold (now the Heritage Hotel). He relocated to the Manukau Shopping Centre and was sacked for being too tatty, then taken apart and left in a rigger’s yard. Santa was later sold for $1; renovated for $40,000; restored again for $100,000; and had his winking eye and beckoning finger removed. 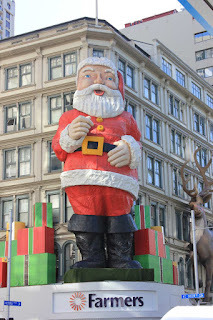 He was the world’s largest fibreglass Santa in 1960; and crowned the world’s creepiest Christmas ornament in 2011. 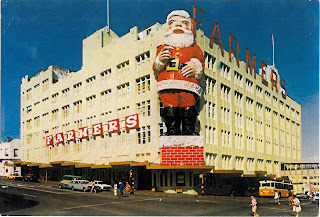 Ref: Coloured postcard of the Farmers Trading Company, 1970s, Sir George Grey Special Collections, Auckland Libraries, 9-1. The five-tonne, 18-metre Santa was built by the Farmers’ display team. It took five men to lift his hand; and 100 men and two cranes to hoist him into position when he was installed above the entrance. Santa’s beckoning finger was part of the original build. Farmers employee Ted Dickens said the wink was put in later, but “some people objected to it. They thought it was lurid for little children to have a big man waving a finger and winking at them, which I thought was pretty pathetic,” he said (New Zealand Herald, 12 December 2010). One mother told Truth (20 December 2002) that Santa had traumatised her five-year-old daughter, who no longer wanted to celebrate Christmas. “Santa sits up there and looks menacing,” she said. 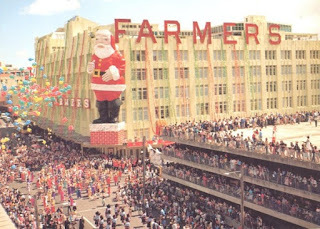 Ref: Santa Parade, 1983, Auckland Farmers Santa Parade. Santa was taken to Manukau City Centre in 1991 after Farmers closed in Hobson Street. This was to be a short engagement. Five years later the centre’s manager, Mark Schiele, said Santa looked old and tired. As the youngest city in the country Manukau needed a fresh image (Central Leader, 4 December 1996). Made redundant for a second time, Santa spent the 1996 festive season in pieces at a crane hire company before being left in a field at the Westhaven tank farm. To save him from being dumped, special events executive Stephen Hanford bought Santa for $1 in 1998. He organised a $40,000 make-over with a team of over 40 workers and returned Santa to the inner-city where he perched on the Whitcoulls building at the corner of Queen and Victoria Streets. Mr Hanford gifted Santa to Whitcoulls when he moved to Australia in 2003, but five years later Whitcoull’s could no longer afford to pay $55,000 a year for Santa’s maintenance, storage and installation. They in turn gifted him to the city, and thus the ratepayers of Auckland. 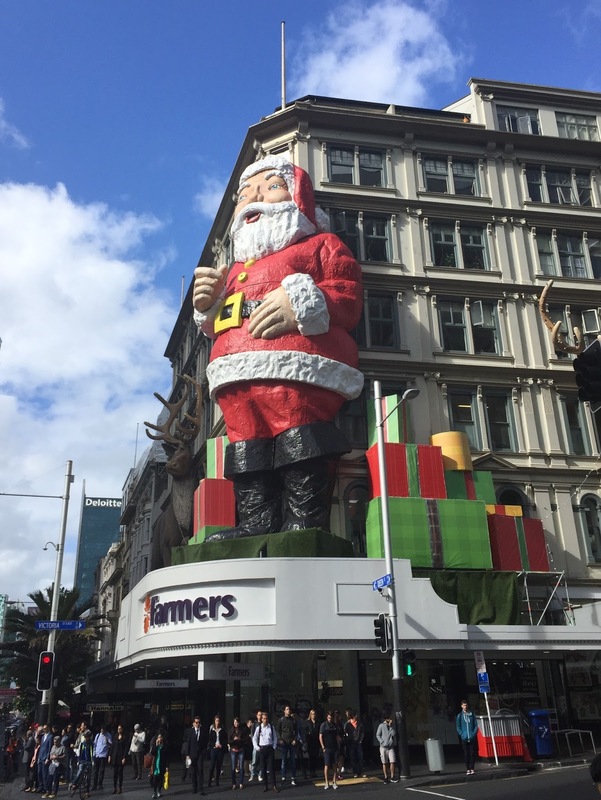 The Heart of the City lobby group asked Aucklanders if Santa was ready for retirement. His moving finger and dodgy wink were becoming increasingly unpopular and considered “seedy,” according to the group’s head Alex Swney (New Zealand Herald, 11 December 2008). After a spirited debate, the public voted by a ratio of 2:1 for Santa to stay - although Mr Swney agreed it was time to address his seedy look. A popular American website, cracked.com, had voted Santa the world’s creepiest Christmas ornament partly because of his “come-hither” finger. Ref: Matt Elliott, Whitcoull's Santa Claus, December 2015, Sir George Grey Special Collections, Auckland Libraries, 1385-114. After a $100,000 restoration Santa returned to the Whitcoull’s building with a jolly new smile, and minus his wink and moving finger. The sculptor who performed the facelift, Damien Kutia, said Santa’s eye took about an hour to remove with an angle grinder. He later sold it on Trade Me for $790 and donated a percentage to the Child Cancer Foundation. Meanwhile, Santa’s annual costs had soared to $180,000 by 2014 and Heart of the City could no longer afford to foot the bill. Property development company Mansons TCLM pledged three years of support for Santa - thus saving him from retirement, again, and SkyCity pledged $50,000 for storage. Ref: Farmers Santa, 28 November 2016. Last year, Santa once more found work at Farmers. 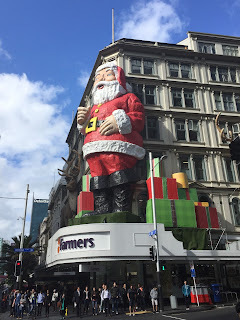 The company opened in the refurbished Whitcoulls store on 12 November - just in time for Santa to be erected on the corner of the building that weekend. Well researched Leanne! What an interesting tale. Funny! Brings back childhood memories - thank you. If they were to ask me I think he should retire. Photos are enough!